1) "Waiting for a Star to Fall" was literally inspired by a falling star. 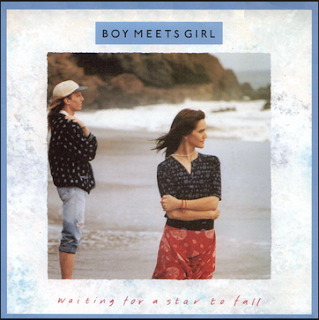 The singing/songwriting duo of Boy Meets Girl was at a big, outdoor concert and could have sworn they saw a falling star in the night sky. Have you ever seen a falling star? Yes, I have! :) I love to watch the sky. 2) They offered this song to Whitney Houston, who declined to record it. Whitney did have hits with two other songs they wrote: "I Wanna Dance with Somebody" and "How Will I Know?" What's your favorite Whitney song? I like her version of I Will Always Love you by Dolly Parton...I like Dolly too though. I am a huge fan of Dolly. 5) In 1988, when this song was popular, 98% of American homes had a TV set. Today, that figure has dipped to 96%, presumably because Millennials are watching more content online. What's the last video you watched online? I can't remember...probably something on YouTube...maybe a make-up video. 8) Michael Douglas took home the Oscar in 1988 for his portrayal of Gordon Gekko in the movie Wall Street. The American Film Institute named Gekko one of the "top movie villains of all time." Do you think bad guys are as interesting as good guys? Oh yes!!! 9) Random question: Have you ever seen a photo of yourself naked? (Baby pictures don't count.) no way! Isn't Dolly terrific? There's such joy in her work. When I watch her perform, I get the feeling that there's nothing else she'd rather be doing than making music. I am excited to see this on your page and I also take part in the Saturday 9. I will have to write mine today. I love your answers. Have a great day! I actually like Dolly's version better, but probably because I am a fan of Dolly while not really one of Whitney. Have a great Saturday, Lori! I am off to shopping with my daughter and grandson. Ahhh another gal who thinks bad guys are interesting!!! LOL I too hope to never see a naked photo of myself.... Have a great day! I'm not really a Whitney fan--I like Dolly much, much better. Lots of Dolly fans out there! (Me, too.) She has such a great voice -- but so did Whitney. I seem to be the only Saturday-9er who's seen a naked photo of themselves as an adult. Maybe I shouldn't admit it! Happy Saturday, and have a wonderful week! I like Dolly too. Funny how most of us don't ever want a naked picture as an adult!! LOL I enjoyed your answers!! Happy weekend! I think we all agree on that last question!.. YIkes!!!! I rate Dolly and Whitney right up at the top of my favorites for sure. And, a naked picture, I don't think so!!! I miss hearing Dolly on the radio. I love her song Hard Candy Christmas. REally enjoyed reading your answers and I think your blog looks so cute and Spring like.